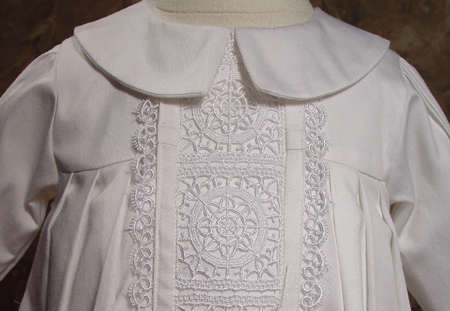 Gorgeous traditional cotton sateen long-sleeved bishop's gown is ornamented with venise lace and pin tucking. This heirloom gown includes matching hat and slip. 28" long. 100% cotton. Hand wash. Shipped with elegant padded hanger and zippered vinyl bag. Heirloom Preservation Bag recommended for long term storage.